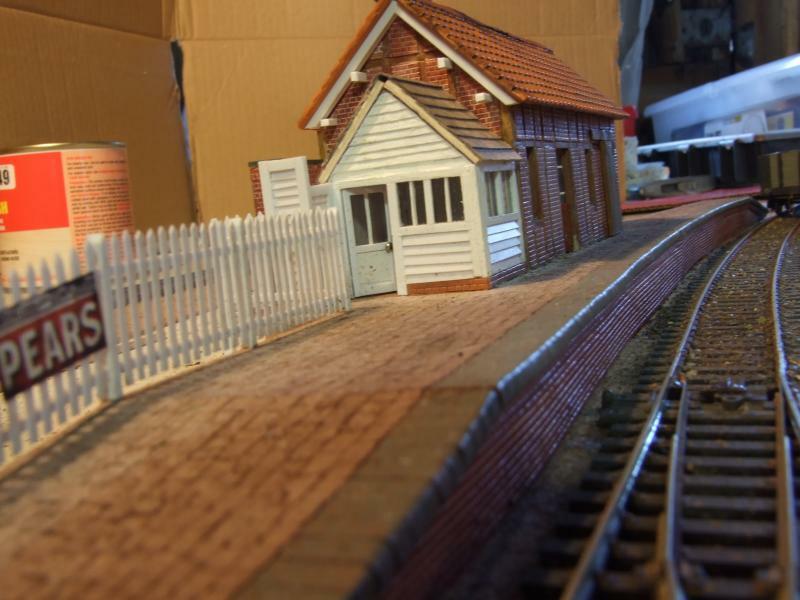 This thread describes how I built the structures for Hemyock over the winter months, there are still more to do but this shows the progress to date. I had not built anything for 30 years or more and even then I had only completed one thing, looking back it was not that accurate either so in a way this was a completely new start. To get the feel of things I started off nice and simple. I had a look in my scrap box and found a block of mdf that just happened to the ideal height so this was used as the base, I stuck some plastic on top to represent the slabs and scored the shapes of them into the surface. 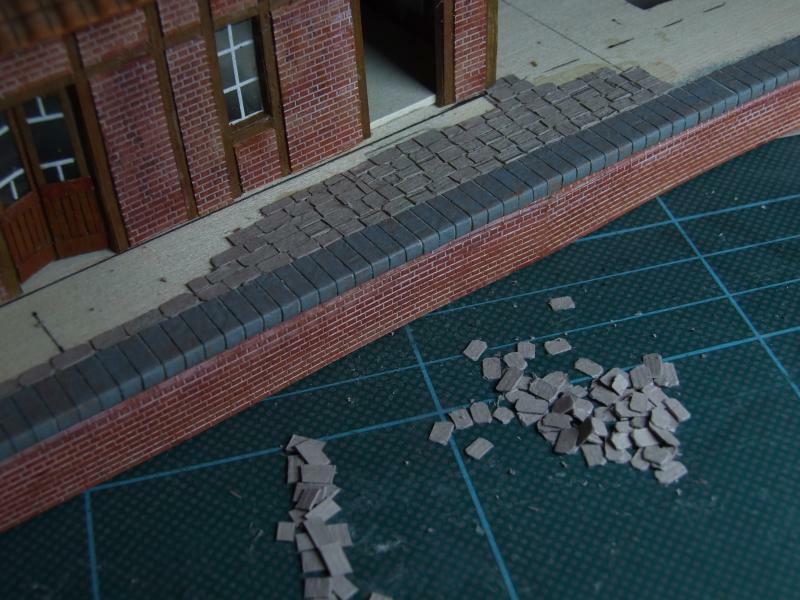 I then cut some individual stones from card and fixed these to the side to complete the base, then some thin strips of wood were cut to represent sleepers and these were used to make the support wall for the ramp. This picture will explain everything. Now the base was completed it was time to move onto the pen itself. 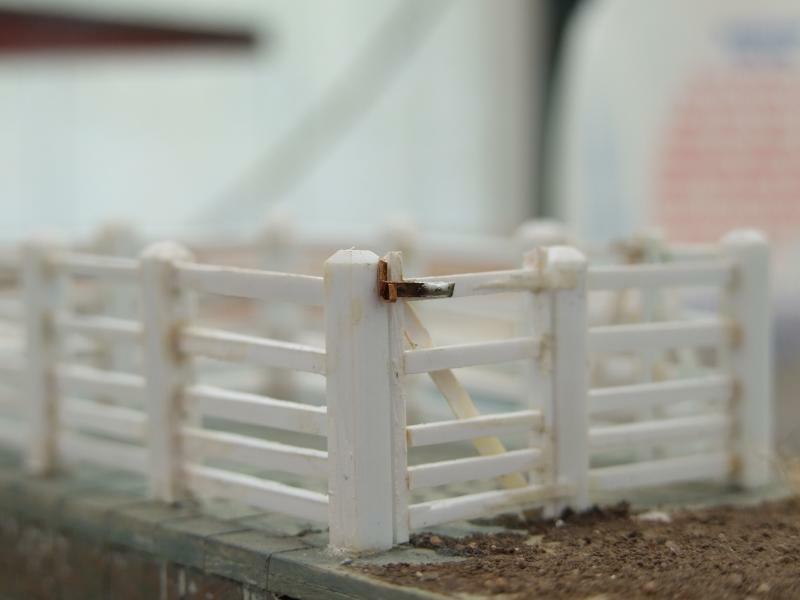 This was made from Plasticard, the uprights were 3.2mm section and the fence 1mm and once assembled it looked like this. It was at this stage I wondered how to fix the gates, open or closed? 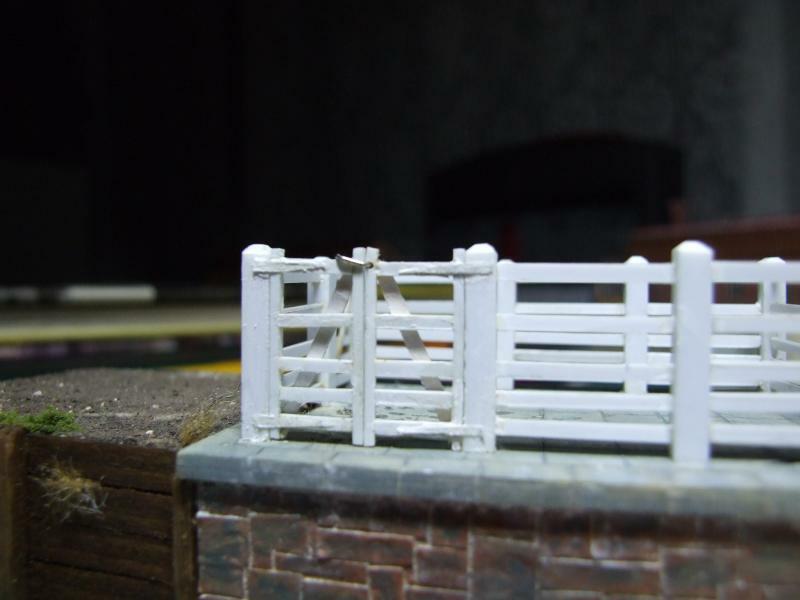 The best option would be to have them as working gates to have either, so that is what I went for, so out came some very fine wire and drills and I gave it a go. 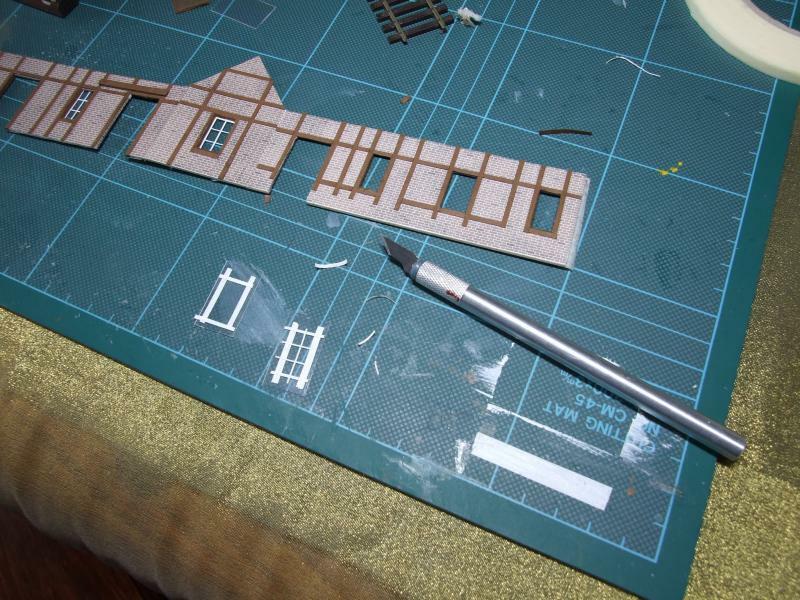 Here are the results in the next four photographs, please ignore the fact the hinges and latches need a bit of paint. 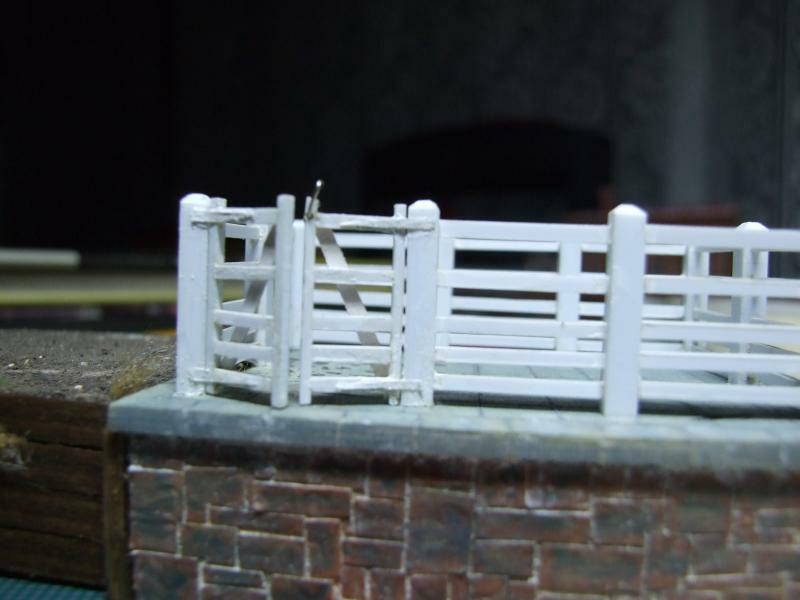 So that completed some working gates which will allow a lot of flexibility for photographs when it is finally fixed in position and a few cattle wagons roll in. 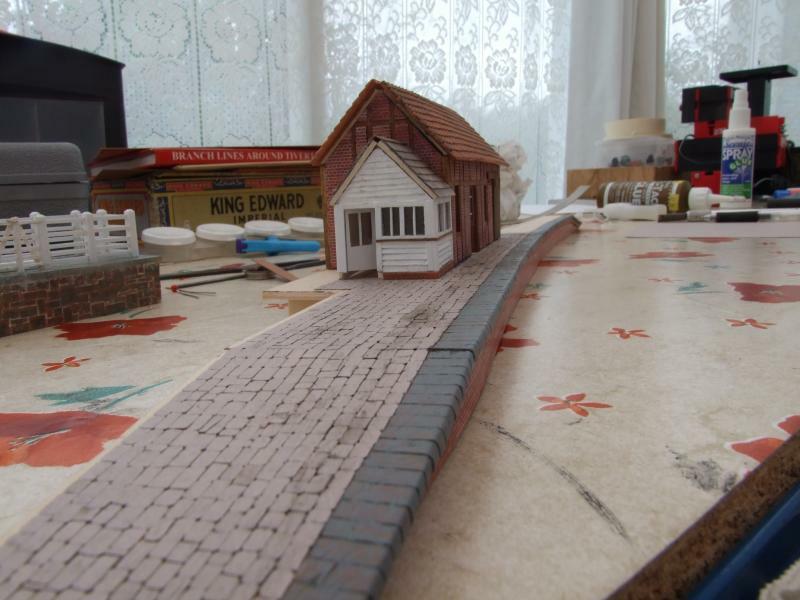 Next up will be the station building and platform which took several weeks so there is a lot to post. The fact they look rusty is accidental as the latch is made from scrap bits of brass that had tarnished slightly, however they will be painted as the structures at the turn of the last century always appear very well maintained. I'd love to model something a bit 'tatty' so I may have to find something on a local farm when I get that far. More pics of the station buildings later today. Fantastic modelling Jim ! 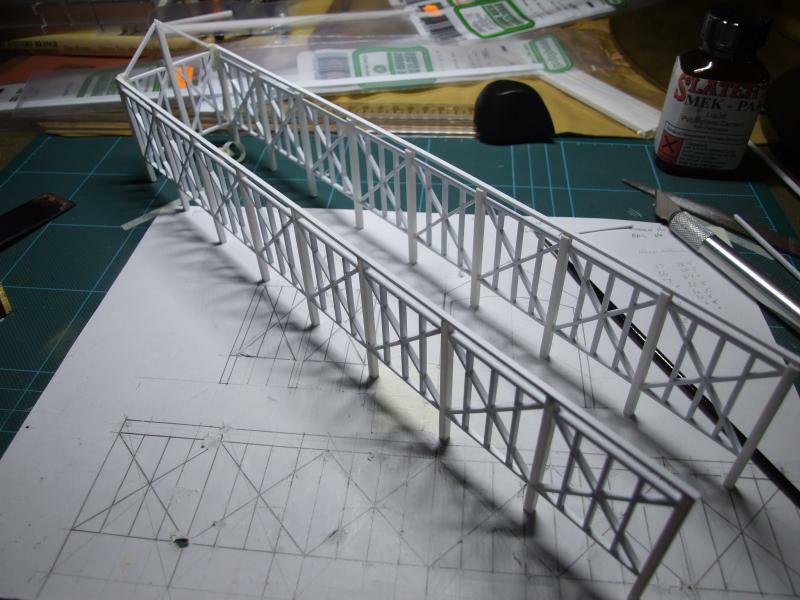 This is going to be one good looking model railway when all is done. 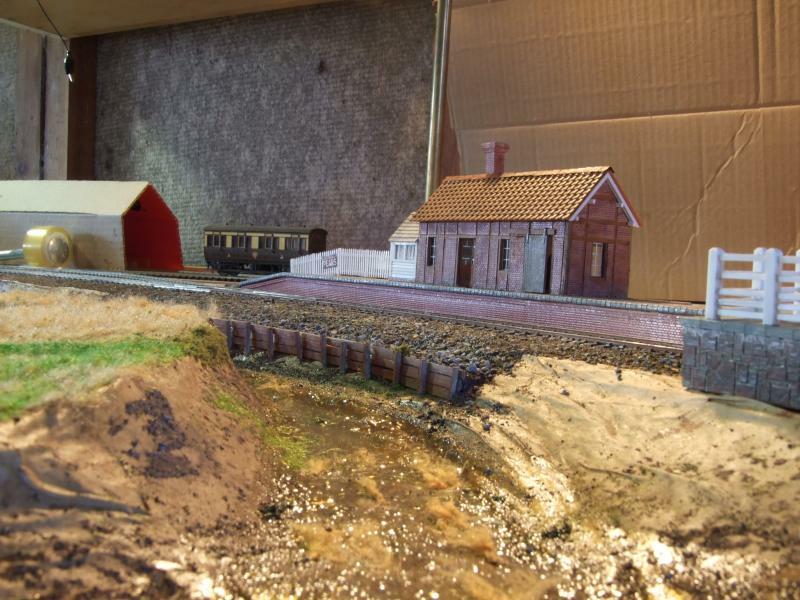 Then again, a model railway is never really finished...! 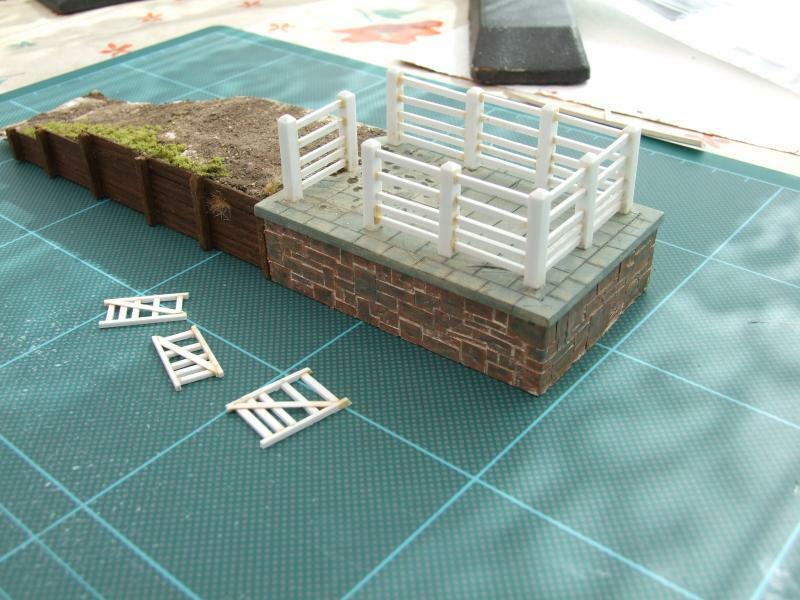 Nice attention to detail, the brickwork looks great and the vegetation on the side of the ramp looks quite natural. For a first effort in 30 years I'd say it was enough to get the nod to carry on? I have tried to update the thread to show further progress but I can't get the pictures from the gallery into the post for some reason. I have tried twice so will try again some other time, I've wasted far too much time already. Outstanding, Jim. 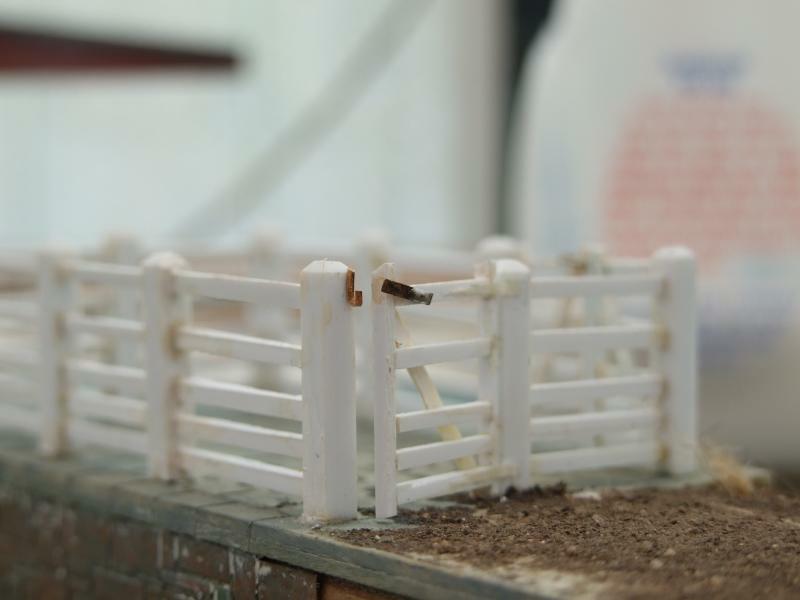 Don't paint those posts and gates too well though - who ever saw a clean animal pen? Not having a good day today, the missus just distracted me and with a click of the button my almost complete update disappeared. Right! for the fourth time. 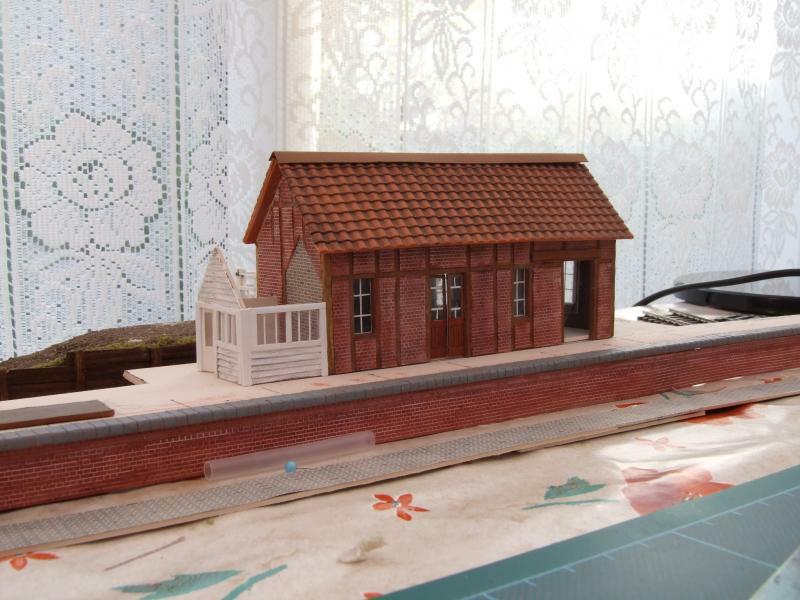 The next project was the station building, this is the one where I learnt how'not to do' things as I ended up making the same thing 2 or 3 times, since then I have got a lot better. I had a lot of card in my materials box so decided that this would form the basic shell of the model. 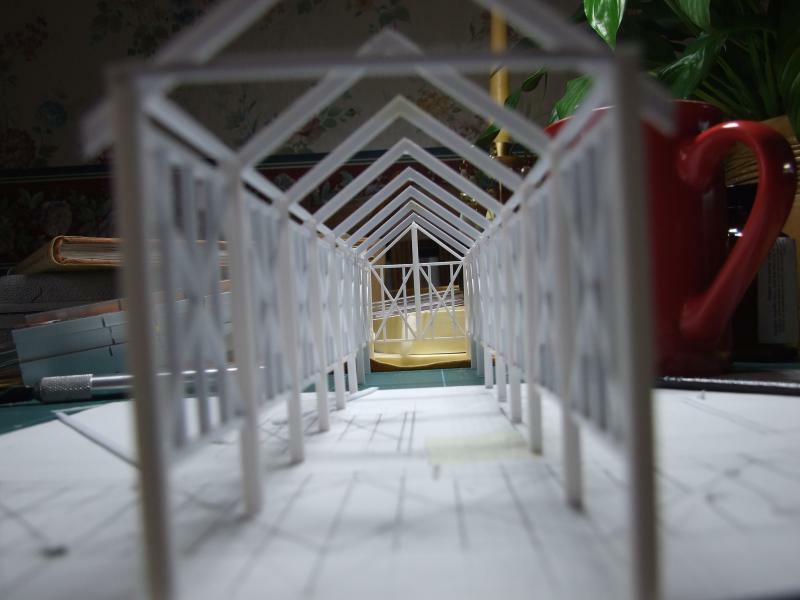 First thing to do was mark out the shape of the building, doors and windows then cut them out and check the model for squareness, I taped all four corners together and compared to the photographs and was quite pleased with the result. 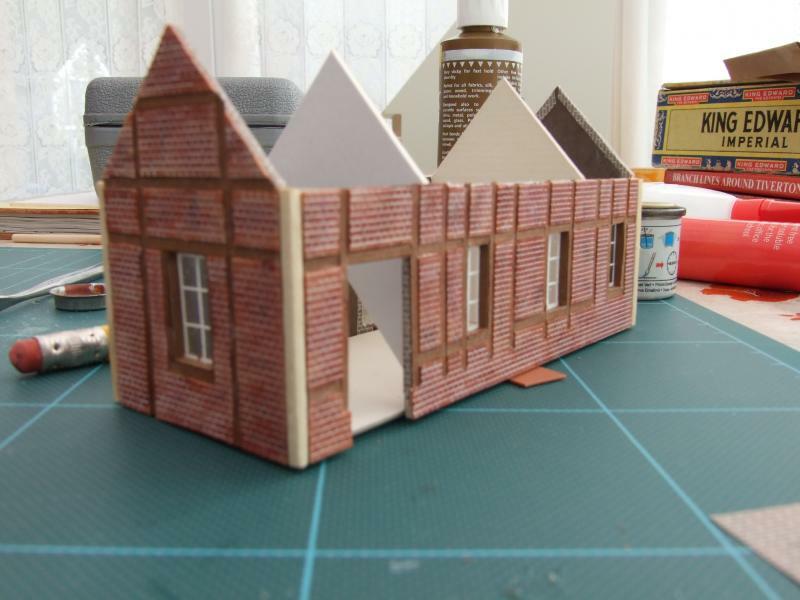 As it was a brick building I covered it with some paper I had, probably many years old and started to add the timber framing which is a feature of the Culm Valley Railway buildings. 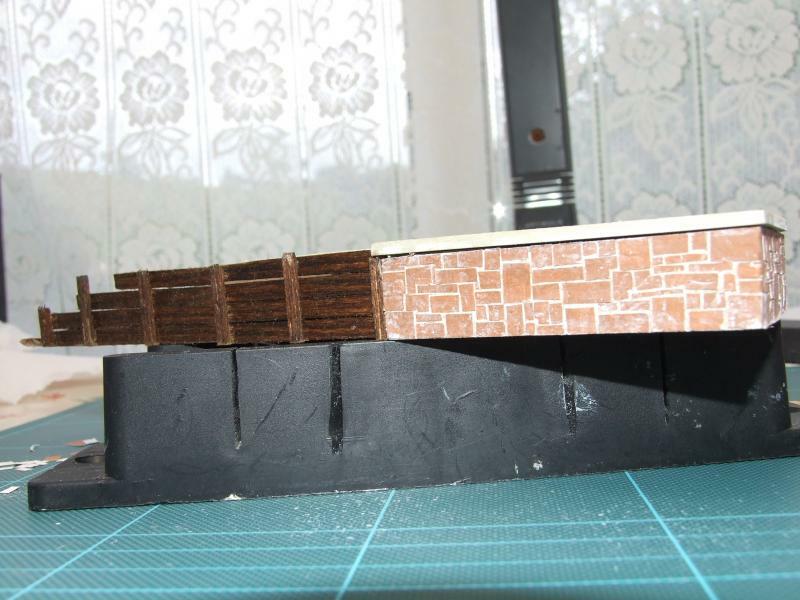 This was carried out with the model laying flat as it made life easier, I thought it would also avoid mistakes in aligning the timbers, I was wrong on that point but never mind it doesn't show.The building in progress. It was at this stage that I became unhappy with the model when comparing it to the pictures I was working from as it just didn't look right, so it was put on hold for a bit of rethink and the ordering of some new materials, yes I actually parted with some money at this stage as I couldn't think of an alternative. Well that's up next, a mug or or two of tea beckons and a bite to eat, it might help the next post run smoothly to. 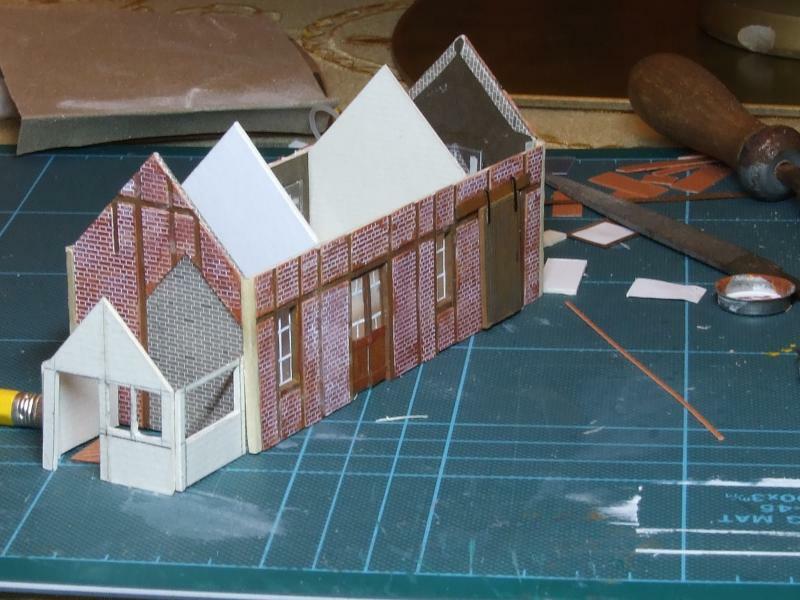 After comparing the model to the real thing I noticed that the timber framing should be set into the brickwork and not on it as I had done, also the paper was fraying at the edges due to continual handling, a different approach was needed. So some plastic embossed brickwork was ordered which would raise the sections between the frames and resist handling. It was an easy enough job cutting rectangles and triangles for the infill except for the back wall which was almost the length of the building and rose up between the frames to the base of the window and to the tops in some places.The new brickwork, corner posts and strengtheners to stop warping, that earlier mistake hardly shows now. 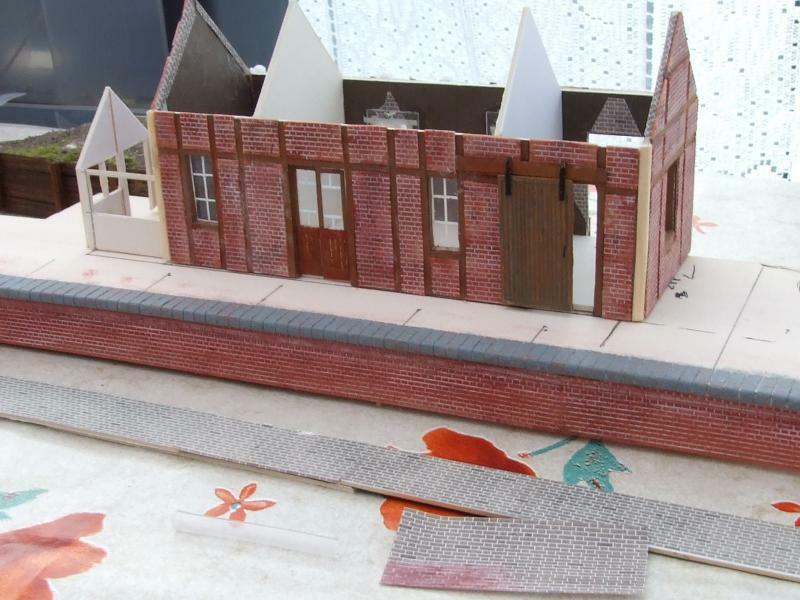 Now that I had the brickwork more to my liking it was time to progress with a few other things, in this case the doors and the signal box which I had to make to get the roofline right on the end of the station building. I have made it so the sliding door to the parcels office slides and the main doors also open and close, this should give me some alternative scenes in photographs later. 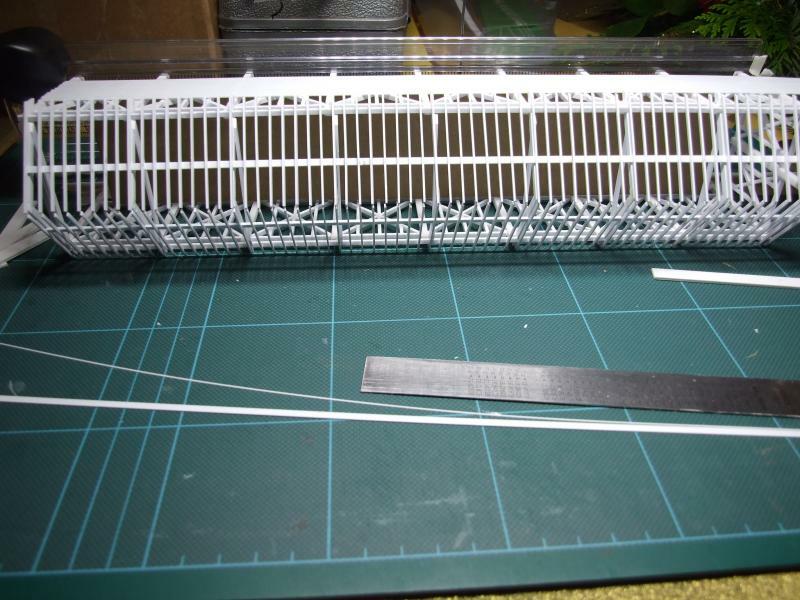 The signal box is again a card structure. 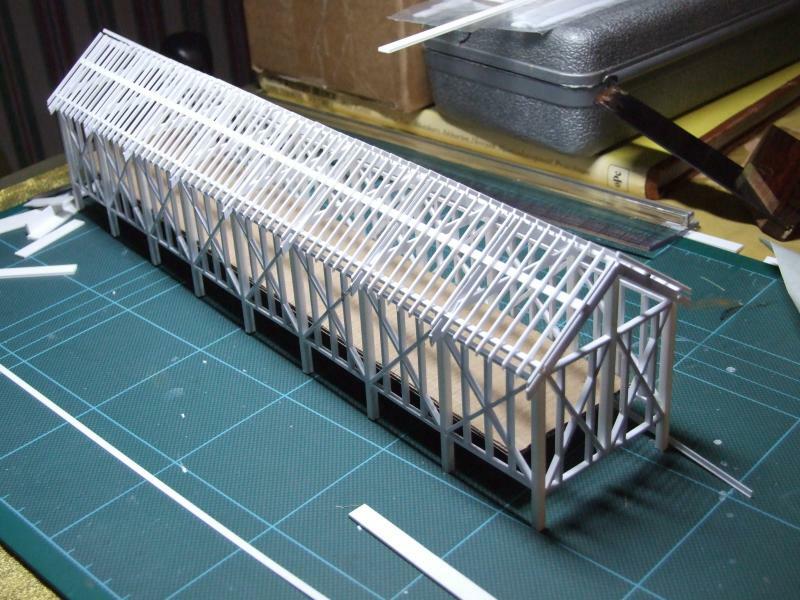 The next stage was to make a roof. I tried to make pantiles but gave up on that after a few aborted attempts and used the Wills pantiles, personally I find them too thick and they still did not fit the prototype but they seemed to do the job. But more on that later. I completed making the windows for the box from plastic strip and the planking to the sides from card, the door was plastic with label framing and again can open/close. 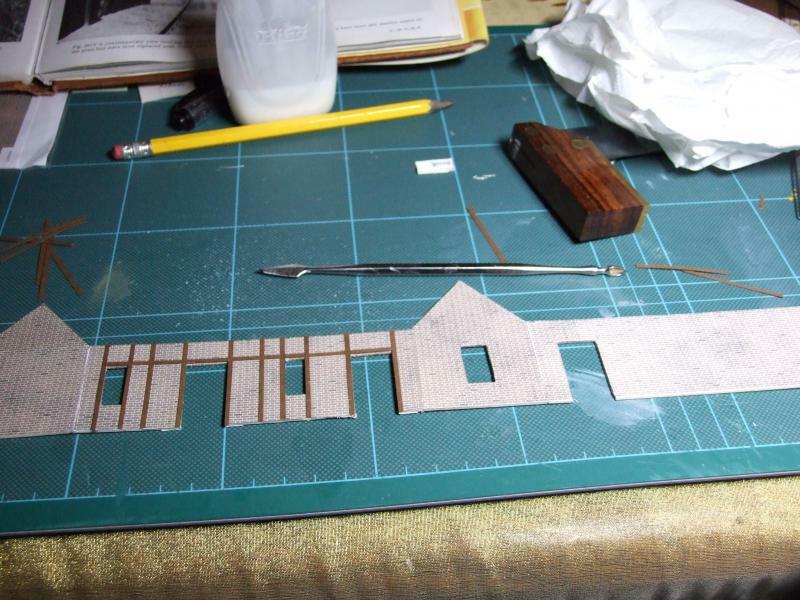 The ridge tile was a length of card which was still waiting to be cut into individual tiles at this point. 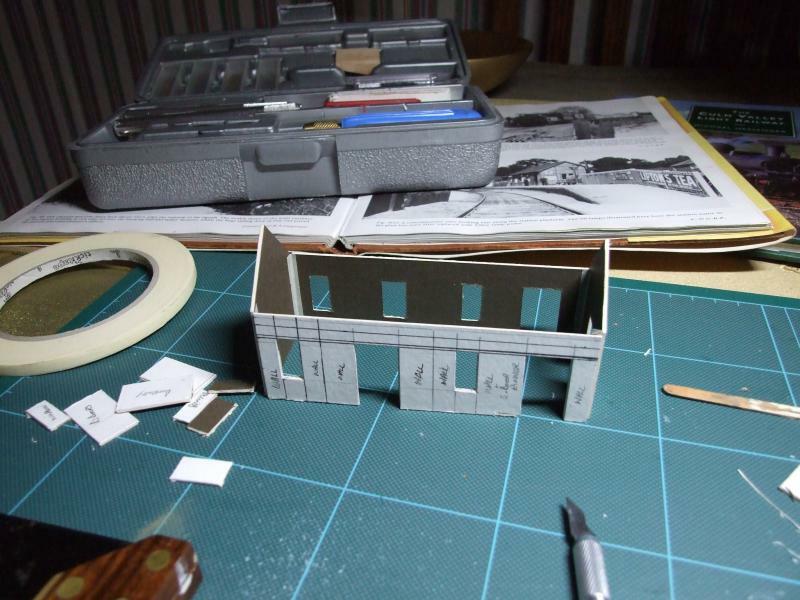 I then made a start on the platformssurface so that I could get the location of the building set. This was started by cutting individual setts which were trimmed on each corner to give a rounded effect, the plain uncut ones are on the left and the trimmed on the right. As it turned out this ws the first attempt! !After laying them along the whole length of the building I thought I had better see how my chosen method of grouting would look, it was a disaster and they all had to come off, better then than when the whole platform was laid. The platform half completed. Everytime I took a picture of this the card planking annoyed me as it didn't look as good or neat as the real thing, they had to go! new plastic ones were added later and looked a lot better. Still no ridge tiles or chimney yet. Now that one end was paved I fancied a break from the stone setts, I laid about 500 at this point so decided to make some fencing to complete the end, yes I could have bought some but where's the fun in that. 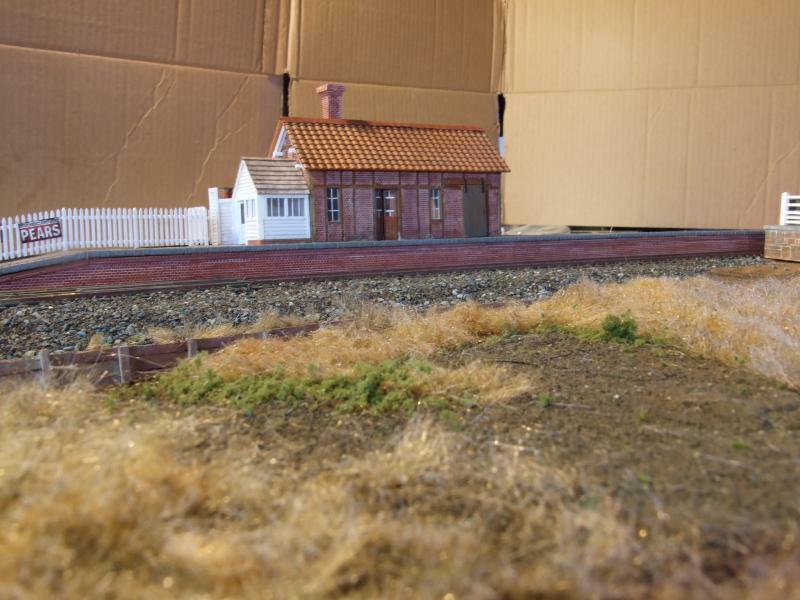 Next up the Carriage shed, a nice easy box with no doors or windows, simple, or was it? "I hope you have enjoyed this update. I have enjoyed it indeed. I do my big posts in notepad or word pad and the copy and paste them into the reply screen. Two, I have a record of what I've posted should I want it in the future for some reason. 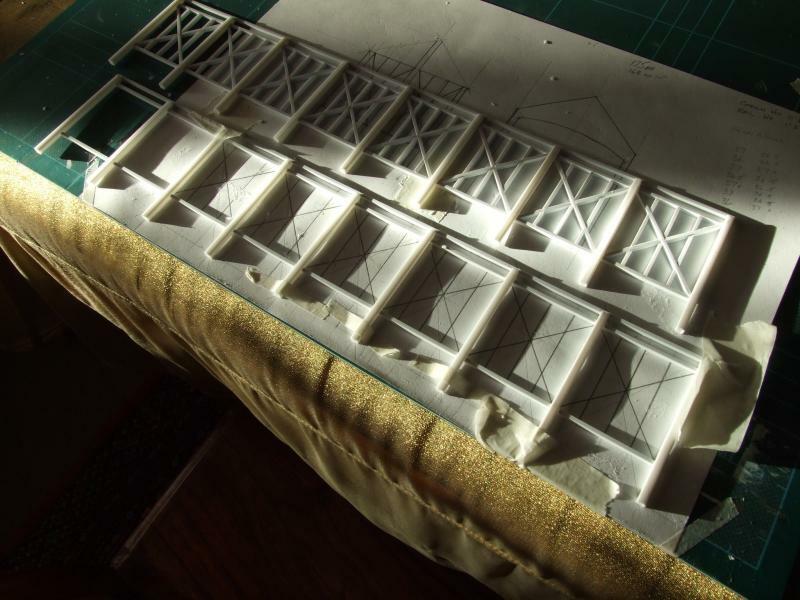 Your patience and attention to detail will result in high quality one-off buildings Jim. Thanks Sol and Marty your comments are appreciated and here is the next installment. I chose this next as it appeared to be a nice simple build of quite a large structure, no windows or doors and just a simple rectangle. A drawing was made after studying the photographs and it immediately became apparent that I would have to model the internal framework. 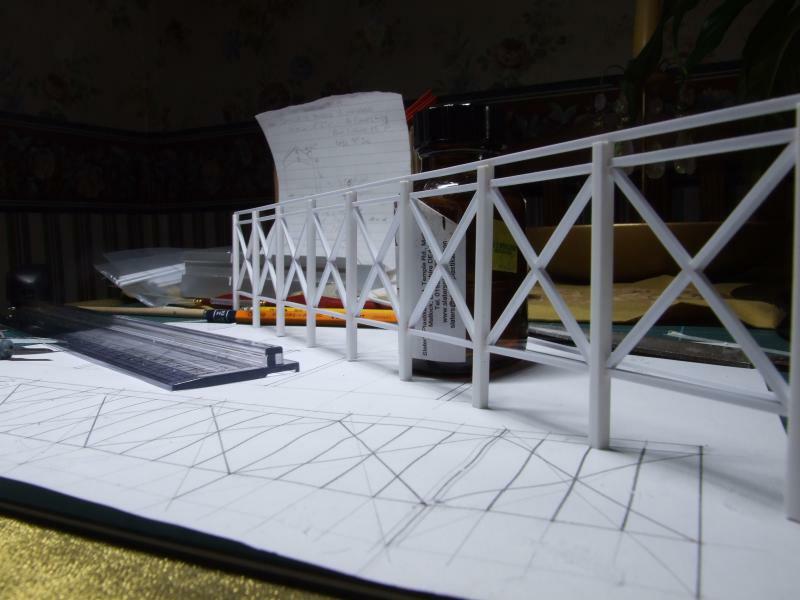 So that was the starting point, I decided to make the whole structure from plastic so the framework was laid out on the drawing and assembly started. The two sides were made first followed by the closed end, this gave the basic structure and it was made square by fixing some temporary spacers across the entrance before finalising the roof details. The following pictures detail the construction of the wall frames from start to finish. 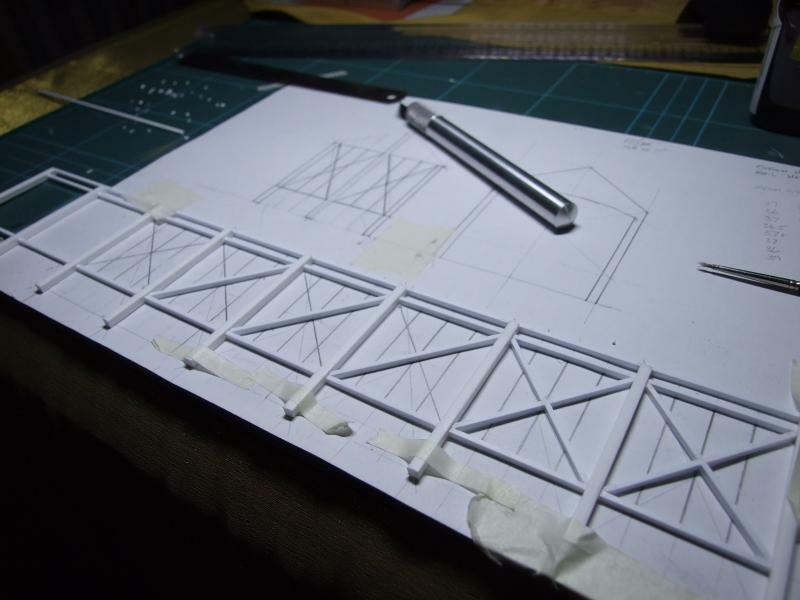 Then came the the uprights around the cross bracing - 64 individual strips. So it was on with the second side. 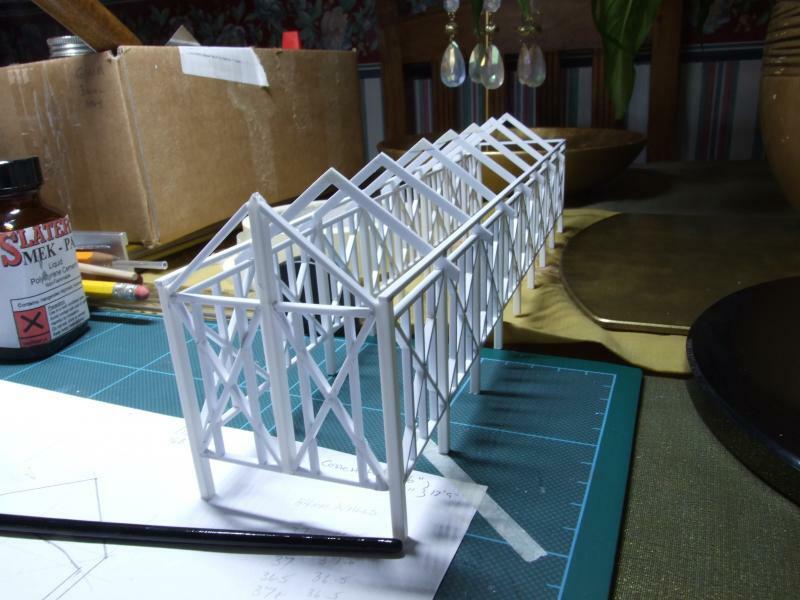 That meant I had to have 9 large trusses and 64 small trusses protruding through the planking on the finished shed on each side, the best way to do this was to build them as part of the structure rather than try and stick small pieces onto the outside later. Or I should say I thought so anyway, whatever one may think it does add up to a complicated but worthwhile build. So on with the main roof trusses, these were cutout to fit between the top two rails of each side and had to be designed to fit. These were then fitted in place to give the correct angle and form of the roof. Finally for now an internal view. 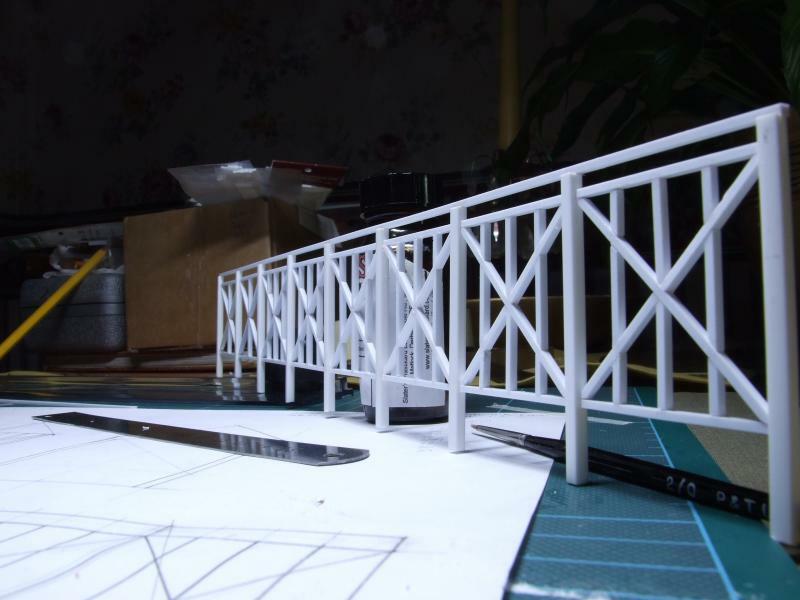 As you can see this was becoming something far greater than the simple build I first envisaged, it already had around 300 bits of plastic in its construction and this was about to increase significantly. More on the Carriage shed saga later, so stick with me if you can to the end there's plenty to come. You've got me fascinated Jim so this is one I just have to watch. 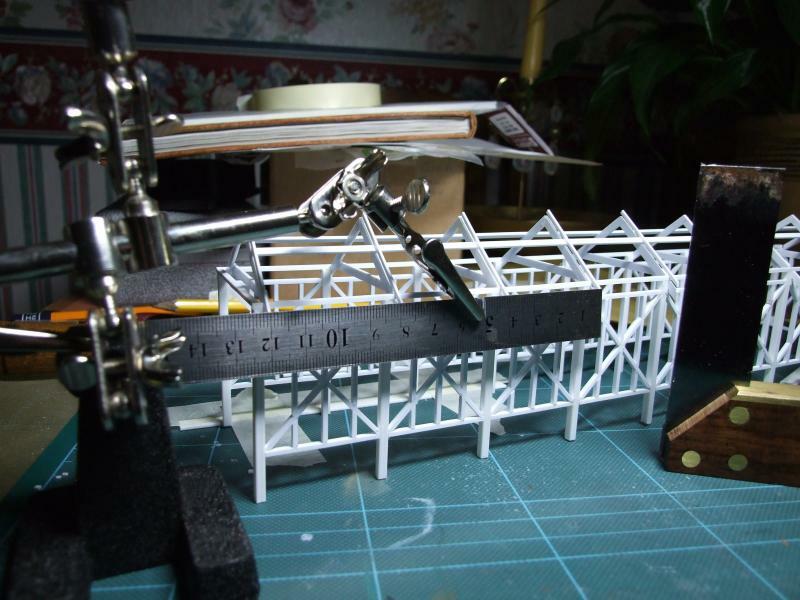 That's some very fine work there Jim and seeing the later pictures reminds me of how I used to make model aeroplanes, ie, laid out on the plans etc., but balsa wood in those days of course. Shall look forward to seeing more of this. If those models are the result of 30 years of idleness Jim, I'm not lifting another finger for the next 30 years ..........by which time, I'll be dead !!! Yippee - I've been retired !!! Please keep it going, I'm enthralled. Thanks Robert, Ken and Peter. Part 2 will appear later tonight with a bit of luck. 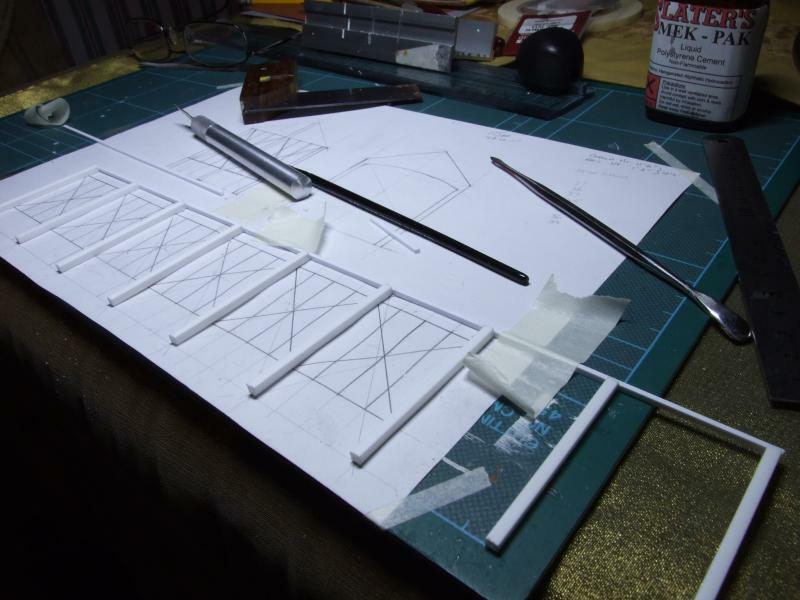 As for balsa wood that is what I used to use on Gliders when I was young, a 6ft wingspan being the largest, but 35 years or more in the plastics industry converted me, for fiddly bits anyway. Up here on the 'Wolds' there isn't much else to do apart from model, certainly no interruptions anyway. As for the model 30 years of modelling frustration must have burst out in one go. 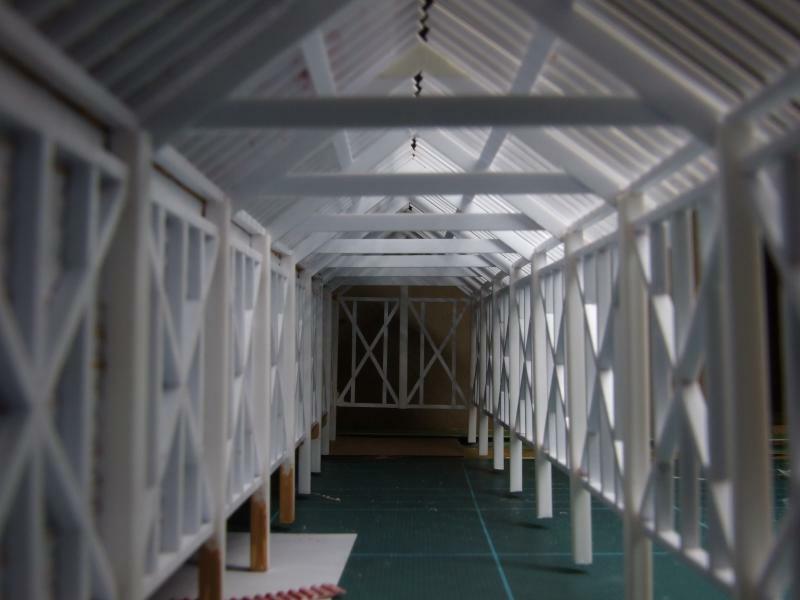 The next part was fitting the smaller struts to the to form the roof, these had to be higher than the large ones so some longitudinal beams were put in from one end to the other sitting on top of the larger ones, the small struts were then fitted on these and secured to the base rail. The reason for this is that as the ends are visible externally and the tops (in the apex) are not then it was more important to get the bottom end correct. 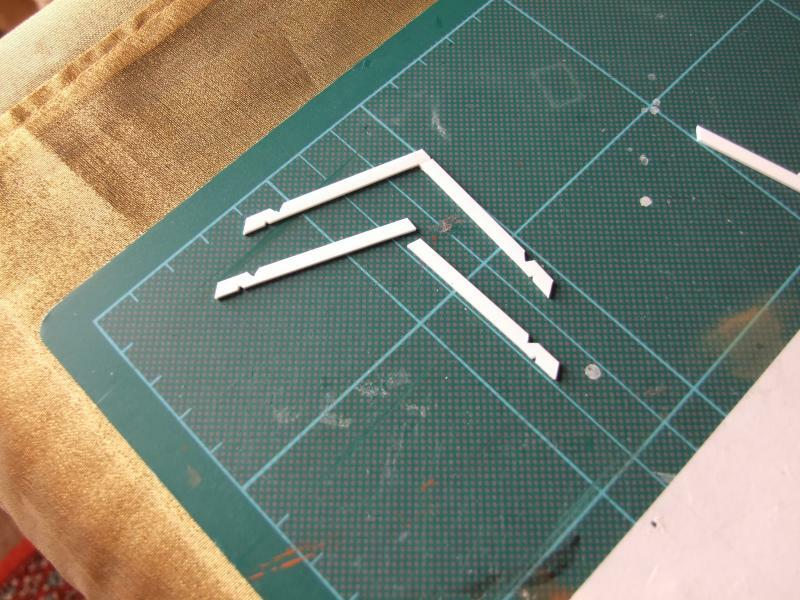 Each strut had to be 5mm apart and as level as possible, after a few false starts I came up with the following method of fixing them. 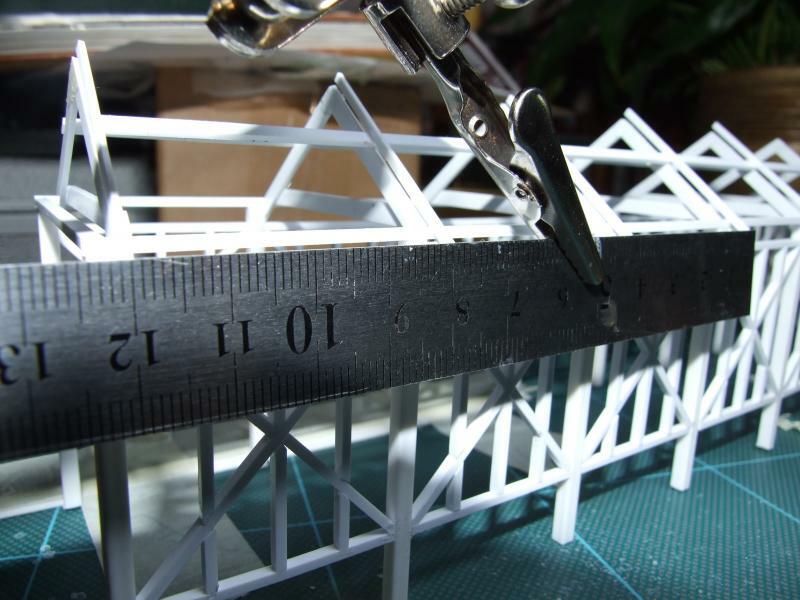 I found later that I had to change the rule position so that it laid flat as a slight bend in the rule caused a slight curve to the ends of the struts, otherwise it went smoothly apart from being fiddly. Each part had to be parallel to the last,be upright and be the correct distance. After many hours of patient cutting and gluing it was completed. A few pictures to show the finished roof form. and looking at the top, the building is laying on its side so the whole roof is visible. 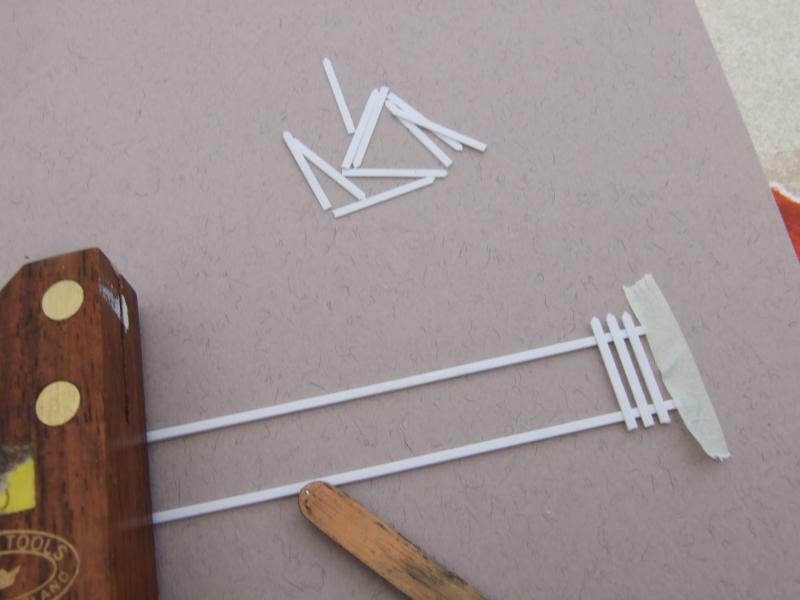 In the foreground is the first plank being made, a length of 2.5 x 0.5mm strip with a piece of 0.5 x 0.25mm glued to it to angle each plank for the feathering effect that it has. I'm amazed Jim. Really superb stuff. You must have the patience of a saint. Fine work and patience indeed. One of the most important tools in the modellers toolbox.